← New European Parliament constituency boundary revision? Voter turnout levels in general elections in the Republic of Ireland, as in most other democracies tend to be higher than those in other types of elections, such as referendum elections, presidential elections and local elections. The same also applies in the case of Dail by-elections; as Figure 1 shows turnout levels for by-elections held during the 1990s and 2000s in the constituencies concerned are consistently lower than those for the same constituencies in the general elections held prior to those contests. Turnout levels across the nineteen by-election contests held to date during the 1990s and 2000s have averaged out at 50.5%. This compares with an average turnout rate of 65.0% for the constituencies involved for the general elections immediately preceding the relevant by-election contests, suggesting that the average drop in turnout levels between a general election and a by-election amounts to an average of 14.5%. The level of decline tends to be more notable when by-elections are held mid-term – i.e. not in the first or last year of a government’s term in office – and the average decline in turnout levels for such contests amounts to 15.7% (average turnout of 48.4% for mid-term by-elections contrasting with average turnout of 64.1% for corresponding preceding general election contests). 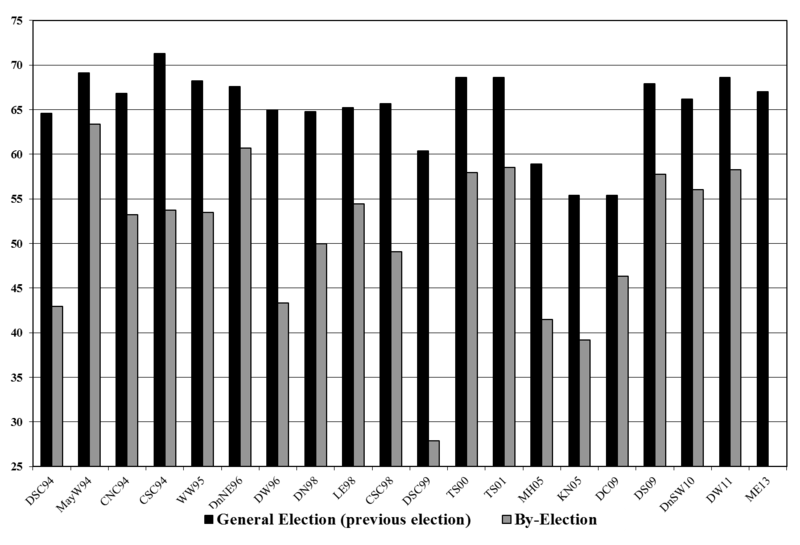 As the patterns shown in Figure 1 suggest, however, there is no consistent pattern to the level of turnout decline between general elections and by-elections, with limited levels of decline applying in some cases while the drop in turnout levels in other cases far exceeds the average rate of decline. During this period, the biggest level of turnout decline associated with any of these by-elections occurred in the case of the October 1999 Dublin South-Central, which was also associated with the lowest ever turnout level recorded for a Dail electoral contest. The turnout level for this by-election was 27.9%, representing a drop of 32.1% on the 60.4% turnout level recorded in the constituency for the general election immediately preceding this, that of the June 1997 General Election. There were two other instances during this period in which the turnout level fell by more than twenty percent for the by-election contests. The turnout level of 43.0% for the 1994 Dublin South-Central by-election marked a 21.6% decline on the 64.6% turnout level recorded for that constituency in the November 1992 General Election, while there was a similar level of turnout decline recorded in Dublin West between the November 1992 General Election and the April 1996 by-election. The lowest level of turnout decline recorded between a general election and a by-election was associated with the old Mayo West constituency, in which the 63.4% turnout level recorded for the June 1994 by-election in this constituency marked a decline of just 5.7% on the 69.1% turnout level recorded in that constituency for the November 1992 General Election. The only two other by-election contests were associated with by-election turnout declines of less than ten percent were the April 1996 Donegal North-East by-election (turnout level of 60.7%, compared with a 67.6% turnout for the 1992 General Election), the June 2009 Dublin Central by-election (turnout level of 46.4%, compared with a 55.4% turnout for the 2007 General Election) and the June 2001 Tipperary South by-election (turnout level of 58.9%, compared with a 68.6% turnout for the 1997 General Election). In geographical terms, voter turnout levels at by-elections are lowest in Dublin, with an average turnout level of 47.5% recorded for by-elections held in the region during this period, or of 46.4% when the neighbouring commuter belt constituencies of Meath, Kildare North and Wicklow are also included in this analysis. The average turnout decline between the preceding general election and the by-election is 16.5% in the case of the Dublin constituencies or 16.6% in the case of the larger area including Dublin and its commuter hinterland. By contrast, the average by-election turnout was 59.1% for the rural constituencies, with this marking an average decline of just 8.8% on the average turnout levels recorded for those constituencies (67.9%) in the preceding general election. The level of turnout decline may not be as marked when other election contests are being held on the same day as a by-election – this can be evidenced in the cases of the last three by-election contests in Dublin, which were either held on the same day as the 2011 presidential election (Dublin West) or the 2009 local and European elections (Dublin Central and Dublin South). While by-election turnout levels usually tend to be lowest in Dublin and especially in relation to turnout levels in the preceding general election, the level of decline was not as marked as for the other Dublin contests in these three cases. Based on turnout averages for electoral contests held during the 1990s and 2000s, there is a notable difference between turnout trends relating to the day of the week that a by-election is held on, with Wednesday contests appearing to be the least successful in terms of pushing by-election turnout levels up. Two by-elections during this period were held on a Tuesday and the average turnout levels for these was 52.3%, as compared with an average turnout level of 66.2% in the preceding general elections in the two constituencies concerned, marking an average decline of 13.9%. Not including the upcoming Meath East by-election, three by-elections during this period were held on a Wednesday and the average turnout levels for these was 44.3%, as compared with an average turnout level of 63.5% in the preceding general elections in the two constituencies concerned, marking an average decline of 19.2%. Eight by-elections during this period were held on a Thursday and the average turnout levels for these was 54.8%, as compared with an average turnout level of 68.0% in the preceding general elections in the two constituencies concerned, marking an average decline of 13.2%. Five by-elections during this period were held on a Friday and the average turnout levels for these was 46.9%, as compared with an average turnout level of 61.3% in the preceding general elections in the two constituencies concerned, marking an average decline of 14.4%. Just one by-election during this period was held on a Saturday and the turnout level for this was 58.9%, as compared with an average turnout level of 68.6% in the preceding general elections in the two constituencies concerned, marking an average decline of 9.7%. This entry was posted in by-election, Election data, Voter turnout and tagged by-election, Donegal, Dublin South Central, Dublin West, Kildare North, Meath East, Tipperary, voter turnout. Bookmark the permalink.